When you are located at the very tip of Cape Cod surrounded on three sides by water and known as a fun-filled tourist destination in the summer, it’s tough to convince vacationers to come to town off-season. 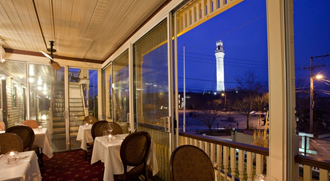 However, if you’re looking for a place where the stark beauty of the winter’s ocean captivates and the rowdy, crowded streets of summer turn into the quiet charm of a seaside fishing village, then Provincetown is the perfect getaway and the luxurious Crowne Point Historic Inn and Spa is the perfect place to stay. After the Dusty Miller Inn, an old sea captain’s house originally built in the late 19th century situated on a hill overlooking Provincetown Harbor, was purchased in 1999, the new owners sought to buy the adjoining carriage house and three other properties in order to create a new type of vacation entity for Provincetown - a self contained year round resort. 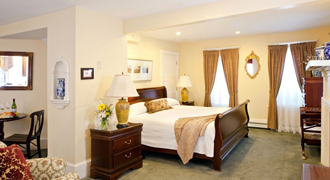 While Provincetown has a number of inns and guest houses, only Crowne Point is a full service facility offering a destination that has all the amenities of a full resort. With a first class restaurant, The Bistro, open every day except Mondays and Tuesday during the winter months, a full spa, gorgeous accommodations with working fireplaces and whirlpool tubs in many rooms, Crowne Point is a perfect place to escape the rush of everyday life, relax and be pampered. 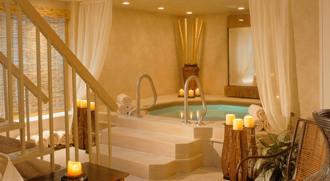 A highlight of a winter stay at Crowne Point is taking advantage of the famous award winning Shui Spa. Here the weary guest can truly luxuriate with a complete spa experience that includes access to a relaxing massage by a skilled, trained licensed massage therapist, a soak in the warm mineral therapy tub, a sauna and steam room and separate rooms for manicure and pedicure. For healthy eaters, a special Shui Spa cuisine is available to make a total spa experience. One of the truly unique elements of the Crowne Point experience is the alternative accommodations they provide. The new luxury penthouse residence combines the privacy of a private home with all the conveniences of a five star hotel. This two-story, two bedroom residence sleeps four in an open loft-like setting with cathedral ceilings, six skylights and central air conditioning. The second-floor main living area provides spectacular panoramic town views and features a dining table seating eight, a living room area with 42-inch plasma TV and Franklin stove/fireplace, and a chef’s kitchen with six-burner gas stove, double ovens, stainless steel appliances and a wine refrigerator. In addition to the penthouse residence, Crowne Point also offers a deluxe two story suite, several executive and deluxe suites and a number of “pamper me” guest suites designed to accommodate the most discerning vacationer. Most of the suites come with a fireplace and /or a whirlpool tub as well as flat screen TVs, CD players and wireless internet access. No discussion of the Crowne Pointe experience would be complete without a discussion of the gourmet cuisine available year round at the Crowne Point Bistro provided by Executive Chef, Robbin Haas. The Bistro features a full range of freshly caught local seafood including lobster, Wellfleet mussels and the Bistro’s famous clam chowder and crab stuffed flounder. For those who appreciate beef, the grilled filet mignon and Angus beef burger are two of several choices available. The Bistro also offers a gourmet breakfast. While Crowne Point offers everything you might want or need for your winter getaway, it would be a mistake not to take advantage of the limited shopping available and the opportunity to really look at this incredibly charming fishing village without the hordes of people who crowd the streets during the summer. 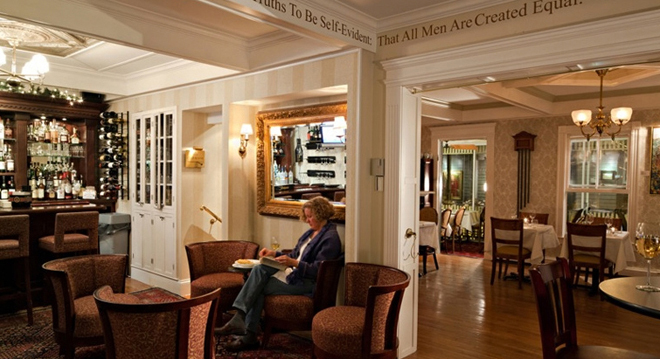 All images are provided courtesy of Crowne Point Historic Inn and Spa.